If you are over the age of 45, you almost certainly have Presbyopia. This is to say that one day you realized it was difficult to read a menu, a receipt, or a label on a product. When this happens, you have two basic choices: buy drugstore reading glasses (“readers”) or get Progressives – “bifocal eyeglasses without the line”. Essilor is the global leader in eye health and corrective eyewear. When the technology for Progressive lenses was pioneered in 1959, so-called Baby Boomers were not yet a cohort. Fast forward to the 2000s and Essilor’s predictive revenue model was red hot with the promise of millions of adults hitting middle age. A robust pipeline was built in anticipation of the demand. However, by 2010, sales were falling short. Humans weren’t behaving like the numbers said they would. If Boomers are largely educated and affluent, and eyes are at the top of the health priority list, why were so many people opting for inferior $12 reading glasses instead of filling a prescription to wear Progressives? What were the obstacles? Procrastination? Cultural stigma? Misinformation? Something else? This study consisted of two phases: videotaped ethnographic research with Boomers who use corrective vision (Consumers) and videotaped one-one-interviews with subject matter experts. Consumer study involved in-depth in-home interviews with individuals and couples across the U.S. Each participant also completed a workbook prior to the interview. Our experts represented academic specialties in procrastination, aging, sexuality, and epistemology. We also included a Hollywood film archivist to inform cultural understanding of historical use of eyewear props to create character shorthand (eg “the nerd”, “the coolcat”). A pattern quickly emerged in our Consumer data: Boomers who required corrective eyewear as children and adolescents were intensely more opposed to Progressives in middle age than those who began wearing glasses as young adults. Those opposed to Progressives told of painful childhood memories being teased and feeling “different”. Men were called “4 eyes” and women recalled hearing “boys don’t make passes at girls who wear glasses”. Equally, those who wore glasses as children spoke rapturously of the day they were able to be fitted for contact lenses. This event was a milestone in their confidence, perceived sexual desirability, and sense of fitting in. All critical things for teenagers. Probing this pattern further with our Experts, we uncovered aggravating influences. Teen years are highly formative for identity and sexual awareness. In the late 50s through early 70s (when Boomers were teens), eyeglasses were popularly used in entertainment and advertising as a way to signal a nerd, a curmudgeon, or an ugly duckling. 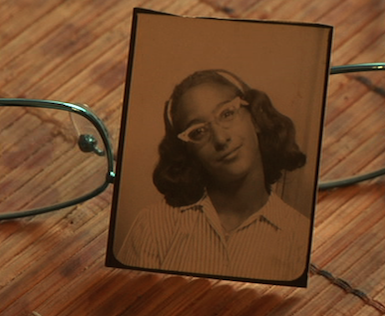 “That girl with glasses”: A photo that one participant showed us of her in eyeglasses during her teen years (early 1960s). Additionally, these same Boomers experience aging/menopause in a time of “60 is the new 40”, Botox, and Viagra. This is a wholly new pressure for people to look younger than they are and telegraph virility and fertility longer than any generation before them. This pressure on Boomers, and obsession with youthful appearance, is unprecedented. Despite their understanding that Progressives offer a simpler, healthier, and more accurate vision solution, these Boomers perceived the contact lens/reader combo as a more desirable way to feel in control of their social-esteem (how others saw them). This lay at the heart of their hesitation and procrastination to fill the Progressives prescription; the reason the predictive data models failed Essilor. Our findings encouraged Essilor to shift their thinking about Progressives as a rational decision to one of an emotional decision. We recommended various strategic marketing alliances that could help position Progressives within fashion and beauty contexts and leverage cultural currency through celebrity and product placement. Most importantly, we pointed Essilor toward a new training paradigm for their distribution channel of eye health professionals and opticians that was based on greater emotional sensitivity: reading cues of middle aged patients, how to talk to them about aging with confidence, and have empathy for them. For more case studies and to learn more about Bad Babysitter, visit us at thebadbabysitters.com.